For the past few years, my family has been trying to live a healthier lifestyle and consume more nutritious foods. It isn't always easy though. We do like our convenience products and a few sweets here and there, but we have started reading nutrition labels and buying organic whenever possible. However, I grew up in the south, and fried foods have always been a comfort food and a staple in our dinner menu often. On our quest to eat healthier, I have been wanting to cut out the vegetable oil that I normally use. I have been hearing a lot about coconut oil lately, but admit, I've been a little chicken to try it for myself. I really love coconut flavor, but my husband and kids don't. I was worried that it would alter the flavor of our favorite dishes, making it taste like a coconut. When LouAna contacted me to try their coconut oil in a recipe, I almost passed on the offer. But after reading about it a little more, my curiosity got the best of me, and worry turned to excitement. Coconut oil actually has many health benefits. Not only is it a heart healthy food, it can actually help our bodies resist bacteria and viruses that can make us sick. It can also improve insulin in the body, boost thyroid function, and increase the metabolism. I was sent a large jar of LouAna Coconut Oil for my family to try. When opening the jar, I was a little confused as to how to use the product. It was in solid form, which I wasn't expecting from an oil. I was able to scoop some out with a metal spoon fairly easily though. I had no problem getting it to melt over medium heat. It melted clear, and I did not notice any scent when it was cooking. I first used it to fry some chicken nuggets. The nuggets brown up nice and golden in the coconut oil, and I was pleased that there was no coconut flavor on them at all! They tasted the exact same as they do when I use vegetable oil to fry them. Since I do a lot of baking, I decided to try coconut oil in my favorite Zucchini Bread Recipe. Again, there was no difference in flavor, and the bread had the same consistency it has when I use other oils to bake it. Mix all ingredients together until thoroughly combined. Pour into two medium size greased and floured loaf pans. LouAna Coconut Oil is great for cooking, baking, frying, and popping corn. It contains no trans fat, no cholesterol, is non hydrogenated, and is a non-GMO food. It's also inexpensive! You can purchase a large jar at your local Wal-Mart for only $5.98! If you would like to learn more about LouAna Coconut Oil, or any of LouAna's other oils, be sure to visit their website. While you are there, be sure to check out the recipe section, as well as grab a money saving coupon too! *Disclosure- I received the above mentioned product courtesy of the sponsor for the purpose of this review. No monetary compensation was provided. All opinions are genuine, based on my experience with the product, and have not been influenced by promotional items. Ok, that sounds delicious. I have actually never had zucchini bread before, can you believe that? Girl, you don't know what you are missing! It is so moist and delicious. It's one of my favorite breads ever! We eat them a few times a month. Not the yucky processed ones that you find in the freezer section. Homemade all the way. does it have coconut taste? No Dezzy, there is no coconut taste! It doesn't alter the flavor of foods one bit! In South of India we use Coconut oil for everything-Cooking,frying, baking, Did you know it is also good for your hair-I put it in my and my girls hair overnight and then wash it off in the morning-to give that lovely shine-Its also a good moisturizer-if you have dry skin/lips! I haven't tried it for it's beauty benefits yet, but I love the idea of using it for more than cooking! My daughter has really dry hair from over styling it. I think we will try some on her hair and see how well it goes. Thanks for the tips! Zucchini Bread is so so so awesome. Pinning your recipe. And thanks for sharing the info. on the coconut oil!! It sounds so good! I pinned it. oh, this has me so excited for spring and gardening!! looks amazing. I haven't tried this brand of coconut oil (yet) but am due to get some next week. have to check it out. I love zucchini bread! Also, I've never tried coconut oil before. I'm definitely intrigued and I need to just pick some up and find a recipe! I love coconut oil. It's a great substitute for heavier oils and healthier too. It makes dishes like and airy yet you don't taste the coconut flavor. I have heard so many good things about coconut oil. I really need to try to use it in my cooking more. Brilliant! I have been looking for coconut oil recipes! Thanks, and see you tomorrow for WW! I love zucchini bread and love cooking with coconut oil. Thanks for sharing! Over the past several months have heard more and more about the benefits of coconut oil. I have not yet used it myself, but I am curious about it. I love coconut oil! It works so great and the fact that it is solid is such a plus for me, so much easier to deal with! That sounds amazing! Would love to try it with coconut oil! I love Zucchini bread!! I need to try substituting coconut oil in our favorite recipes. I love using coconut oil in recipes so am super excited to see this one! Thanks for sharing! What a small world! I use Louana coconut oil too! I have heard that organic coconut oil is better for you, but it's too expensive! I am always looking for ways to make our meals and baked goods healthier. I will have to try this! That's what I thought when I first opened coconut oil too. I actually need to get some more. Mine is gone! Oh what a neat idea. I love this type of bread, but never thought of using coconut oil.. hmm. I will have to give it a whirl! When I was younger I would never even try zucchini bread....because it had zucchini in it. LOL. Then I tasted it one day and I was hooked. It's my favorite now! LOVE it! I'll have to try your recipe though. I've never made it with coconut oil. Ok, that looks freaking delicious! I use coconut oil for everything, including facials! I've never used Coconut oil before but I've heard good things. I use that Coconut oil all the time! Never tried it in Zucchini Bread but I need to! That sounds delicious. I've been needing more recipes that use coconut oil! I love using coconut oil in my recipes. Thanks for sharing! I love zucchini bread. I haven't tried coconut oil in recipes yet. I've only used it in my hair. Yum! This looks delicious. I'll definitely have to try it. I've never tried coconut oil - probably because I thought that everything would come out with a faint coconut flavor. Thanks for clearing it up! We LOVE coconut oil in this home! It truly is the best baking addition, and the healthiest! We use coconut oil for my biracial daughters' hair. 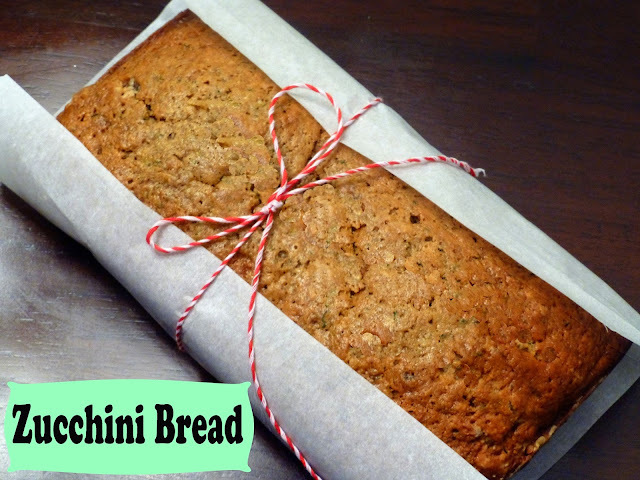 I have only used it once in cooking but love zucchini bread, will have to try this recipe. I use a lot of coconut oil, but I use it for healing. I don't cook much with it but that zucchini bread looks great. I've never even heard of coconut oil, but I love good zucchini bread!